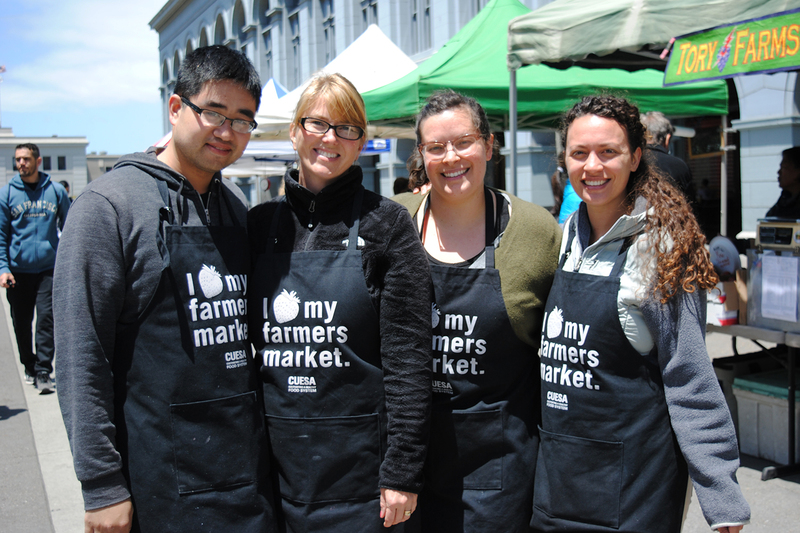 CUESA’s Volunteer of the Month program recognizes the dedication and work of some of our most active volunteers. CUESA relies on volunteers to help with education programs, special events, public outreach, and other activities that help fulfill our mission to cultivate a sustainable food system. Learn more about volunteering and submit an application here. This spring CUESA hosted over one thousand elementary students to learn about local and seasonal produce. This grand effort couldn’t happen without the commitment of a core group of Foodwise Kids interns to coordinate with teachers and volunteers to make this program the success it has been for 6 years and running. They come from different backgrounds, all enriching the program in their unique ways. “This spring’s Foodwise Kids interns brought a range of interests to the program, from culinary education and a desire to work with children to a passion for system change and personal curiosity about farmers markets and local food,” says Education Program Coordinator Tessa Kappe. “As our largest intern team to date, they provided a diversity of support and allowed us to serve over 1,300 students in the spring semester alone. I am sincerely grateful for their dedication and support, and wish them all the best in their next adventures!” Meet the Foodwise Kids spring interns. Carmen Arrambide: I remember seeing Foodwise Kids and other education programs at the farmers market years back when I worked at one of the vendor booths. I thought it was such a cool idea, a way to empower kids. Teaching kids about sustainability and local food from a young age will help shape how they interact with food as adults. Participating in food systems at a local level isn’t just good for the economy; it’s good for your health and body. I didn’t have a single day with Foodwise Kids where I didn’t see kids trying new things, getting excited about fruits and vegetables, and wanting to cook more at home. It made me so happy to be part of that change! Philip Chau: Interning at CUESA was really fun, and I learned a lot from Tessa and the kids. It was important to me because I learned about eating healthier and can better help my parents in the kitchen with all the recipes I learned. I cooked simple recipes with kids but still learned a lot about cooking. Since I interned at CUESA, I feel more confident in working with people of all ages. It also helped me think of jobs related to my experience like teaching people of all ages about healthy, seasonal and local food at farmers markets and hope I can change people’s thoughts about food. Melinda Clemens: Being an intern with Foodwise Kids was an amazing experience. Every Tuesday and Thursday I helped prepare the CUESA kitchen for the two classes of elementary school children excited for their farmers market field trip. Their enthusiasm matched mine as we walked through the market, met farmers and decided on produce to buy. Spring time is strawberry season, and the kids never missed their chance to buy them. Smoothies, fruit salads and the occasional roasted veggie made it to their tables. I loved working with the kids and hearing their delight in trying something new and discovering they “actual” liked it. Each day was a success, especially when I heard one girl exclaim, “When I grow up, I want to be a cooker.” Tessa and the CUESA family do such a great job with this program, and I’m excited to continue as a volunteer helping kids realize that eating well is really yummy! Macy Pogue: During my internship with CUESA, I was often reflective about how influential attending a field trip like Foodwise Kids might have been on my impressionable and curious mind as a young student. I can recall from childhood always having a magnetic attraction to the wonder of plants-the intricacies of flowers and the magic of fruit bearing trees, so this program is close to my heart. On more than one occasion, I would hear students exclaim that this was the best field trip ever. To imagine! The power of plants, and the ability to transform them into fuel to feed the mind and body. Tessa was insistent of continuously reminding the students that almost every ingredient used came from a plant, cinnamon-from the bark of the tree; beets-the roots of the plant with deliciously edible leaves, and broccoli-a bundle of yet to bloom flowers. With the constant barrage of toxic foods imposed upon the diets of youth, programs like Foodwise Kids are urgent and inspirational. They have the ability to transform the way future generations treat their health and the health of the planet. Thank you, Farmers!